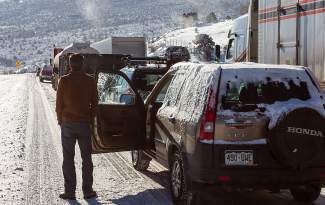 Brion After, of Carbondale, looks for the cause of a traffic backup after a wreck stalled movement on Interstate 70 in December 2013 east of Wolcott. VAIL — Drivers traveling on the Interstate 70 corridor this winter may notice a number of changes on the roads this season. Some of the changes are subtle, but may make for a faster, safer trip — that’s what the Colorado Department of Transportation hopes. CDOT and a number of other state agencies and concerned groups — the Colorado State Patrol, towns along the I-70 corridor, and skiing, lodging and tourism groups — have been working on a plan to make the stretch between Glenwood Springs and Denver a better place to drive in the winter. Last year brought pass closures that lasted for hours, frequent pileups and standstill traffic. CDOT’s strategy to improve upon last winter includes a number of subtle and not-so-subtle changes that will be announced in its I-70 Winter Operations Plan later this month. The winter plan comes alongside some big-ticket projects that are already underway, including the widening of the Twin Tunnels, which should be completed in December, and the addition of a right shoulder toll lane from Empire to Idaho Springs. Among other measures that aren’t obvious to the casual driver are $8 million of improvements on the corridor that includes better signs and more road maintenance staff. A full-time “corridor commander” was hired specifically with the task of improving travel on that I-70 stretch. Less costly, but more noticeable changes that are part of the winter plan will include more snowplows on the passes more often, and for the first time, the holding of commercial trucks farther west in times of bad weather on the passes. A larger truck chain up area is also being planned along I-70 near East Vail. The Colorado State Patrol has begun doing chain checks and plans to more strictly enforce chain laws for commercial trucks. Variable message signs will warn truckers earlier down the road that they need to put on chains, and the messages will also give drivers earlier warning of delays. Drivers can also expect the return on metering on heavy traffic days through Summit County. Cars will be fed onto the interstate intermittently in order to avoid backups at Eisenhower Tunnel. CDOT also has a plan to use “snowplow escorts” to clear the steepest, iciest parts of the passes ahead of vehicle traffic on the snowiest days. Then, there is driver education. The town of Vail and hotels around town are working to give guests fliers explaining what kind of tires and vehicles are needed for getting over the passes. Local tire stores are also pitching in by offering snow tire discount coupons, distributed by municipal and state law enforcement. 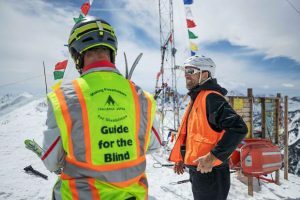 Other efforts are encouraging drivers to change their driving habits and leave the mountains earlier or later. While town of Vail officials say they are pleased with the steps the state has taken to alleviate road conditions, they also say they hope that subsequent years will bring even more changes on the legislative level. Some legislators have made promises to take up the cause, including state representative Diane Mitsch Bush, who wants to introduce new enforcement legislation, and state gubernatorial candidate Bob Beauprez to consider another four-lane highway to access the mountains from the Front Range. Industry and municipality leaders have suggested keeping commercial trucks off the interstate during peak times, but CDOT officials say that’s not possible. Daly said he would like to see state lawmakers set up stricter laws and harsher penalties for drivers without proper tires or equipment. “I’m hoping that in the next several years there will be more aggressive enforcement, tickets or fines for not having proper tires,” he said.